We are continually told by the executives of Google, Facebook, and Twitter that they do not have the capability to track or censor Muslim terrorists who use social media platforms to plan and carry out murder against those who oppose their Islamic agenda. As the result thousands if not millions have been killed. Yet, these same social media monopolies seem to have no problem using computer programs to search out and censor unpopular views on holy-grail issues like; gay marriage, feminism or any contemporary conservative political views that do not comport with their religion of political correctness. A few months ago the publisher of this newspaper posted a provocative Facebook message challenging the hypocrisy of those who simultaneously claim women should be treated “equally” yet, also cry sexism when women are treated equally bad. The point being made was that women are either uniquely different, or they aren’t. They are either equal or they are not equal. It was intended to spark debate and discussion on the issue of hypocrisy in our morally confused culture. 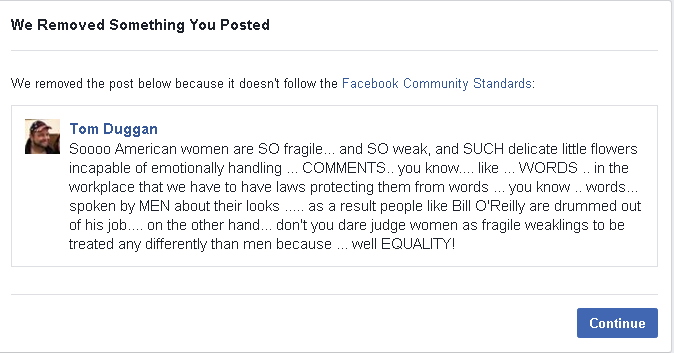 Facebook computer bots searching their database for terms they arbitrarily (and secretly) have deemed “too offensive” for Facebook, removed that post. In fact, several of the Valley Patriot Facebook followers got special text messages from Facebook with a link to that particular post, urging each user to view the post and report it to Facebook if they deem it “offensive” or “hateful”. In our efforts to understand the street gangs dropping bodies all over Lawrence, our volunteers spent an inordinate amount of time on Google and Bing last month, searching for graffiti images and gang hand-signals used by the various gangs causing violence in the city. What we found – or more accurately didn’t find – was “staggering”. With the trillions of bits of data on the internet about these violent street gangs, Google and Bing would have you believe only ONE image of the Trinitario street gang, and ZERO images for several other gangs, have ever been uploaded to the internet. That’s not because these images don’t exist. It’s because the monopoly tech companies have used computer programs to censor your access to them. For more than 200 years Americans have believed that the greatest threat to free speech and a constitutional republic was government censorship of ideas deemed unpopular by government elites and elected leaders. But, in the age of technology, what we have learned these two centuries later is, that we took our eyes off the ball when it came to monopoly tech companies using their platforms to silence unpopular views and information that they alone subjectively deem “hateful”. We believe that it’s time for congress and the president to hold these companies accountable, properly categorize them as monopolies and the public utilities that they are. We also believe, given what we have learned about their capabilities to censor political messages, that they have – and have always had – the ability to stop Muslim terrorists from using their platforms to plan and commit acts of violence and murder. Yet they refuse to do that. Our government officials must demand that they do. What we find most frightening is that these tech companies have clearly shown us all what their priorities are when it comes to what they alone deem “dangerous” in our free society – and what they dismiss as benign. Clearly, Muslim terrorist get more sympathy and protection from these billion dollar corporate tech monopolies, than law abiding American citizens who disagree with political correctness. If congress and the president don’t act on this now while they can, free speech will be a memory we tell our grand-kids. That is, if the terrorists haven’t used Twitter, Google, or Facebook to kill us all by then. Great example of 1Corinthians 15 again. Im so sick of politically correctness! How about spiritually, morally & ethically correct, as it should be. Great article. I would however change one word in the title. Replace Democracy with Republic. People frequently confuse the two and they are vastly different.